Some days I just crave fresh, raw vegetables. On days like that, I find a hearty dinner salad can be just as satisfying as a more elaborate meal. Maybe it's that Spring is right around the corner, but salad has been on the menu a lot lately. Usually, I'm not one to make a fussy dressing. Quite honestly a simple garlicky red wine vinaigrette and am happy. The other night, however, I wanted to jazz it up and made a toasted cumin-coriander vinaigrette. 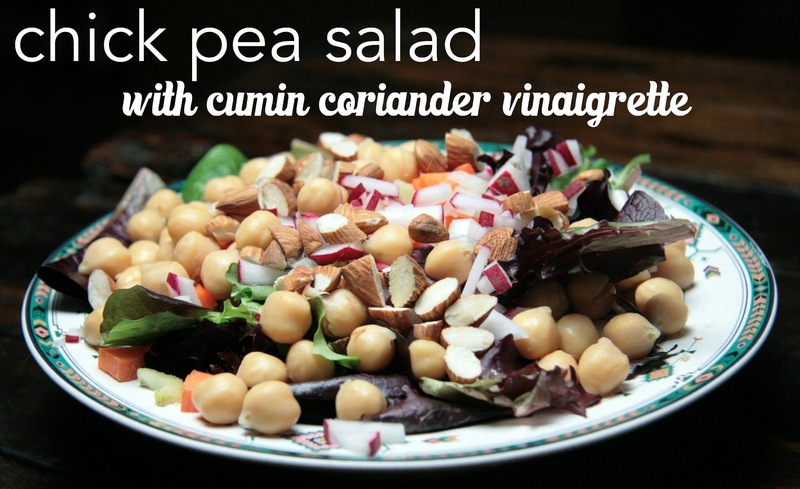 Those aromatic spices paired so well with the chickpeas and added a whole new dimension to the salad. In a small frying pan over medium heat, add the whole cumin and coriander seeds. Shake around the pan until they become fragrant and lightly toasted. Remove from heat and let the spices cool. In the meantime, chop all the vegetables. Toss them in a large bowl with the salad greens. Set aside. Using a mortar and pestle grind the toasted spices. Add the ground spices to a small bowl and pour in the vinegar. Season with salt and pepper. Whisk in the olive oil and continue whisking until the dressing is well combined. 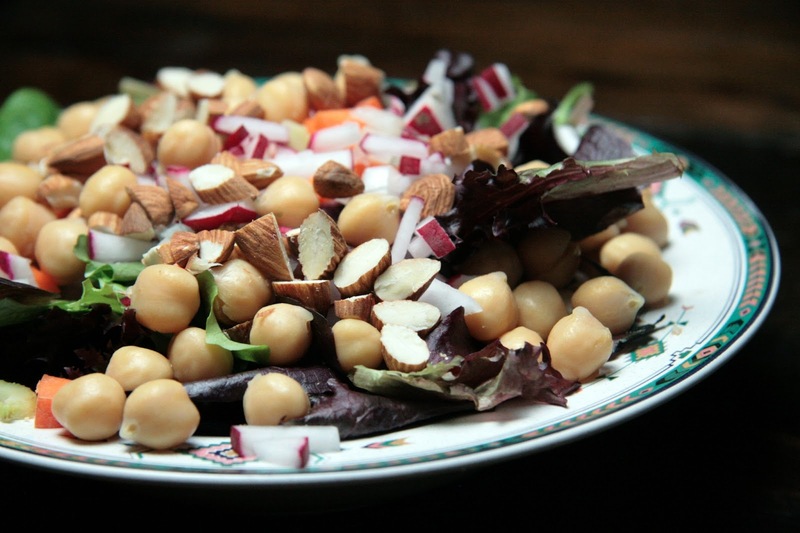 When ready to serve, add the chickpeas to the salad, pour in the dressing and toss. Sprinkle on toasted, chopped almonds and serve immediately. What can I say: "Salad, it's what's for dinner." this looks and sound fabulous! I absolutely love using cumin. Gives everything that wonderful smokey Mexican flavor! Thanks Bonnie. Same here. Cumin is definitely one of my favorite spices.